Tricycles are a source of air pollution and health hazards in Manila. Photo by digitalpimp. This article was edited on March 22, 2013. 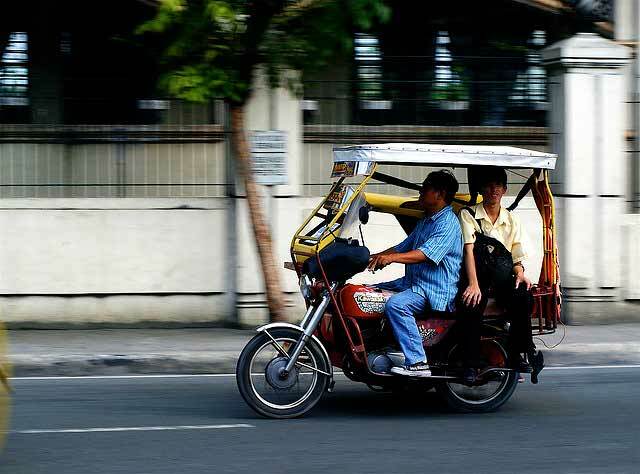 With over 3.5 million currently in operation, the motorized tricycle – a close cousin of the ubiquitous motorized rickshaw seen zipping through the streets of India and throughout Southeast Asia – is an icon on the streets of the Philippines’ capital city, Manila. But the millions of tricycles are taking their toll on the air and on Manila’s inhabitants lungs, in the form of over 10 million tons of CO2 generated and upwards of 4,000 air pollution-related deaths each year in the city. Hoping to curb this hazardous trend, the city of Manila handed-over their first electric-powered tricycles to the Tricycle Operators and Drivers Association of Manila just a year ago. Last week, the Filipino government announced that it would be expanding the electric tricycle (“e-tricycles”) program to 20 other cities throughout the Philippines, putting 20,000 additional e-tricycles on the streets. Based on the Manila one-year experiment, e-tricycles have tremendous environmental and economic benefits – reducing local air pollution, and lowering fuel costs and maintenance requirements. However, assessing the overall benefit of fleets of e-tricycles with respect to other fuels is more complex, and should consider lifecycle costs, upstream pollutants, and other unknowns. How can electric tricycles benefit people in a city? E-tricycles and electric rickshaws dramatically improve air quality. They are one of the best options for reducing emissions locally, as there are no vehicle-related emissions to speak of, i.e. they have no tailpipe. A reduction of transport emissions in Manila would not only prevent, on average, four thousand air pollution-related fatalities each year — it would directly and positively impact the more than 90,000 Manila residents who suffer from chronic respiratory conditions, and dramatically reduce associated health care costs, while making for a cleaner air for the 11.8 million inhabitants of the Manila metropolitan area. But from a driver’s perspective, reducing air pollution does not put bread on the table. Any investment in an alternative fuel mode — whether it be an electric motor, a compressed natural gas engine, or even a gasoline-powered four-stroke engine — must be an economically viable investment for the operator. Like most electric vehicles on the market, upgrading to an electric tricycle has higher initial costs, but in the long run, their fuel economy brings great return on investment. A gasoline-powered tricycle requires an average of US$ 6 of fuel per 100 kilometers, while an e-tricycle requires US$ 1 worth of electricity for the same distance. And similarly, while training repairmen on electric vehicles technologies may take time and money, maintenance requirements are lower for e-tricycles compared to conventional tricycles. The Asian Development Bank, a lead sponsor of the e-tricycle initiative in Manila, also estimates that for every 20,000 electric tricycles introduced to city streets, the country saves 100,000 liters of fuel daily. This amounts to a savings of over US$ 35 million annually. What are the other considerations for the owner, and for decision makers? Charging times is the first aspect that comes to mind. It takes around an hour to charge a tricycle battery from full depletion to full capacity. Then the e-tricycle can operate for 8 to 10 hours, depending on the passenger load. Drivers have to take into consideration the sixty minutes they need to recharge the vehicle battery in their daily operations schedule. In the evenings, for example, time must be set aside to charge the vehicles before the night drivers take to the streets and replace the daytime shift. A sufficient number of charging locations, i.e. electric plugs, must be incorporated into the development plan. Decision-makers should also take into consideration the benefits, and the challenges, that come with switching from a mono-source of energy — mostly gasoline — to a conveyor of energy, like electricity. Their local electricity generation mix, and the load curve, will affect the emissions —including greenhouse gases — and air quality at the country or regional level. And while improving air quality locally, e-tricycles have the potential to affect pollution levels from electricity generation. Their load can help to introduce cleaner electricity sources, but they can also lead to more coal-powered electricity, since roughly a quarter of the Philippines’ electricity comes from coal. However, the “cleanliness” of new electric vehicles depends on both the source of electricity, as well as the emissions associated with the vehicle that is being replaced. The Asian Development Bank estimates that moving to electric tricycles can reduce the greenhouse gas impact of tricycles by 54 percent. We believe that e-tricycles represent one of the many fuel and vehicle technologies that can meet emissions standards and have positive impacts on the environment. However, because of the potential unknowns of various fuels and technologies, governments and operators should strive for a more complete understanding of lifecycle costs and lifecycle emissions (upstream and tailpipe emissions) to inform their fleet decision-making among various alternative fuels. We are also inviting comments on what best practices exist in the deployment of vastly available, low-cost charging options, where vehicle operators can conveniently charge their vehicles. Decision-makers might have a role here, in terms of applying international standards or facilitating accelerate adoption of municipal codes or regulations, so that there is clarity on what the options are for the people giving access to a “plug”. Akshay Mani, Benoit Colin and Elise Zevitz also contributed to this post.